July has been a good month for mail goodies. 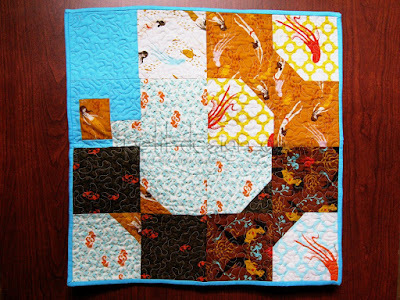 First I got my little quilt from the Modify Tradition Swap quilt from Jennifer of That Girl, That Quilt. I love the Mendocino fabrics and the modern take on the Bow Tie block. 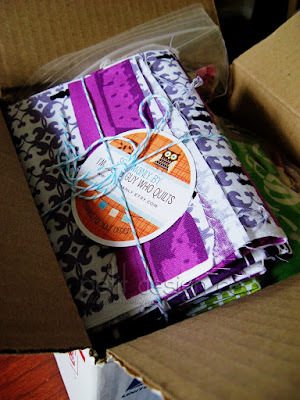 I also got a nice package from Ryan of I'm just a guy who quilts. I was lucky enough to win a giveaway on his blog. I got a nice little set of some very lovely Tufted Tweets! I love the deep brilliant colors of this line. Coincidentally, I won a Tufted Tweets notebook from Ashley of Film in the Fridge (scroll down to see the notebook.) I'll post pictures later because I've been using it to brainstorm new quilting motifs. Ryan also sent a nice collection of scraps! 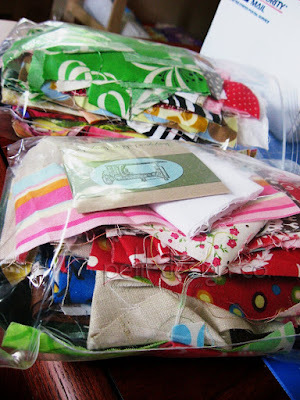 there are so many awesome fabrics in these baggies that would make some very cute hexies or some very awesome string blocks. However I'm restraining myself until I've crossed off a few more of my UFOs. I also received some charm packs that were on clearance for $4 at Hancock's of Paducah. I got two packs each of Kate Spain's "12 Days of Christmas" and American Jane's "A breath of Avignon." Did you get any quilty goodies this month? WOW, you have had a great month. I haven't got any quilting goodies in the mail this month, but I did get to stop at Hancocks in Paduca for about 15 min. Not long enough, but they did give me a sneek peak at some of the new quilt kits that will be available soon. I don't remember many but there is a blue and yellow that caught my eye. I am making an effort to NOT enter and win more stuff until I use more of what I have. it is very difficult when I see a good giveaway. I did get some goodies in the mail though. I got a Gypsy gripper for my rulers along with some fabrics for a PLANNED quilt -how weird is that? me and planned quilt in the same sentence!